Mr. Lincoln had a personal reason to want Wentworth to be mollified. 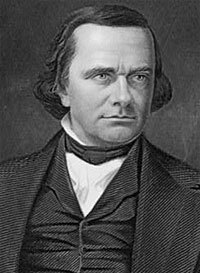 During the 1857 mayoral campaign Wentworth had said in one Chicago speech: “I’ll tell you why they hated me. 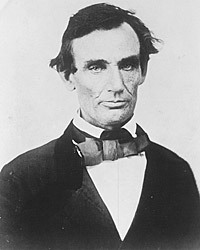 It is because they know that I shall leave No stone unturned to put that man (pointing to Lincoln) in the seat now disgraced by Stephen A. Douglass.”2 Rumors, however, developed that Wentworth wanted the 1858 Republican Senatorial nomination for himself and had a strategy to elect his supporters to the State Legislature. Herndon went to Washington to meet with Senator Trumbull before he went to New York. His visit to Greeley in New York was not productive. “Forget the past and sustain the righteous,” was Greeley’s cryptic advice to Herndon.20 It was a path Mr. Lincoln himself followed. Roy P. Basler, editor, The Collected Works of Abraham Lincoln, Volume II, p. 428 (Letter to Henry C. Whitney, December 18, 1857). Douglas L. Wilson and Rodney O. Davis, editor, Herndon’s Informants, p. 677 (Letter of Edward L. Pierce to William H. Herndon, September 15, 1989). Albert J. Beveridge, Abraham Lincoln, 1809-1858, Volume II, p. 567-568. William H. Herndon and Jesse W. Weik, Herndon’s Life of Abraham Lincoln, p. 326. Don E. Fehrenbacher, Prelude to Greatness: Lincoln in the 1850s, p. 71. Douglas L. Wilson and Rodney O. Davis, editor, Herndon’s Informants, p. 267 (William H. Herndon interview with William Jayne, August 15, 1866). Douglas L. Wilson and Rodney O. Davis, editor, Herndon’s Informants, p. 575 (William H. Herndon interview with John Armstrong, February 1870). Don E. Fehrenbacher, Prelude to Greatness: Lincoln in the 1850s, p. 122-123. Don E. Fehrenbacher, Prelude to Greatness: Lincoln in the 1850s, p. 126. Isaac N. Arnold, The Life of Abraham Lincoln, p. 146-147. Roy P. Basler, editor, The Collected Works of Abraham Lincoln, Volume III, p. 334 (October 30, 1858). The Letters of Stephen A. Douglas, p. 428. Robert W. Johannsen, Stephen A. Douglas, p. 652-653. Robert W. Johannsen, Stephen A. Douglas, p. 653. Don E. Fehrenbacher, Prelude to Greatness: Lincoln in the 1850s, p. 63. William E. Barton, The Life of Abraham Lincoln, Volume I, p. 400. Roy P. Basler, editor, The Collected Works of Abraham Lincoln, Volume II, p. 430 (Letter to Lyman Trumbull, December 18, 1857). William H. Herndon and Jesse W. Weik, Herndon’s Life of Abraham Lincoln, p. 319-320. Albert J. Beveridge, Abraham Lincoln, 1809-1858, Volume II, p. 549.